I’m now on the never-ending quest to find the perfect carrier for Cupcake. Knowing this, a friend sent me one of her carriers she wasn’t using, a Jackson Galaxy Double Extendable Pet Carrier by PetMate. This carrier struck me immediately when I took it out of the box as being made of really sturdy material. With carriers, you have two choices: lightweight or sturdy, and this one definitely falls on the sturdy side. It weighs about 3.5 lb on its own, which isn’t bad, but you can feel that the material it is made of is intended to last. I appreciate that, because Cupcake’s carriers live rough lives. 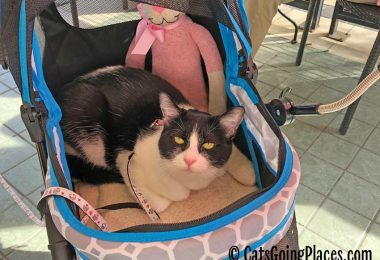 Cupcake uses her carrier at least twice a week to go out. When the carrier is at home, all four cats treat it like a playhouse. That can cause a lot of wear and tear on a carrier that isn’t well-built. The Jackson Galaxy Double Extendable Pet Carrier ships flat, but it’s easy to put together. The two ends stand up and zip to the center section, making a carrier that initially looks a lot like a gym bag. 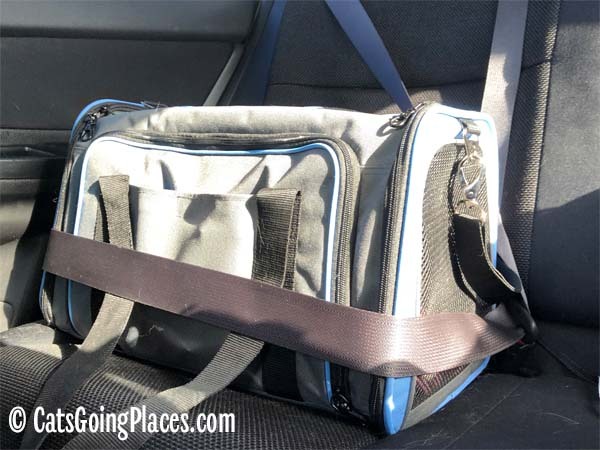 Unlike a gym bag, it has rigid ends, so it’s easy to secure in the car when it’s time to head out for adventures. The carrier tapers toward the top, so the seat belt is unlikely to slide down and off the carrier once it is snug even though there aren’t straps or fasteners for it. The bag has mesh windows at either end and top, but the long sides of the carrier are solid. This was something that Cupcake wasn’t accustomed to, and she tried to look out the end to see the humans in the front seat of the car. The reason there are no windows on the long sides of the carrier is its extendable feature. 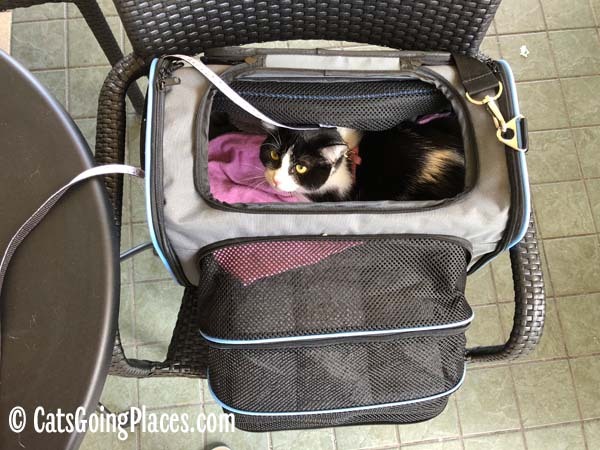 Both sides of the carrier can fold down to give the cat inside significantly more room.  This is a really great feature if you are traveling and can’t let your cat out of the carrier for an extended time but want her to be able to stretch out a little bit. The fully-expanded carrier has a really big footprint, 17.5″ x 28″. You can see in the photo above it doesn’t really fit on top of the patio table on our local coffee shop. With a petite cat Cupcake’s size, I can’t imagine using both extended sides at once very often. 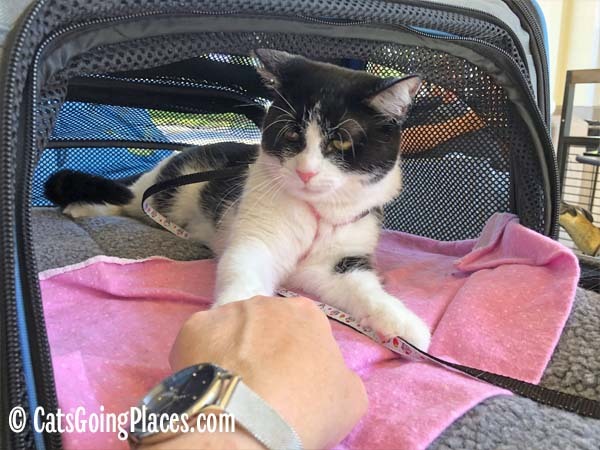 Cupcake tended to want to hang out in one end or the other, although she stretched all the way out along the carrier’s extended width when I unzipped the mesh on one end and offered her a fist bump. 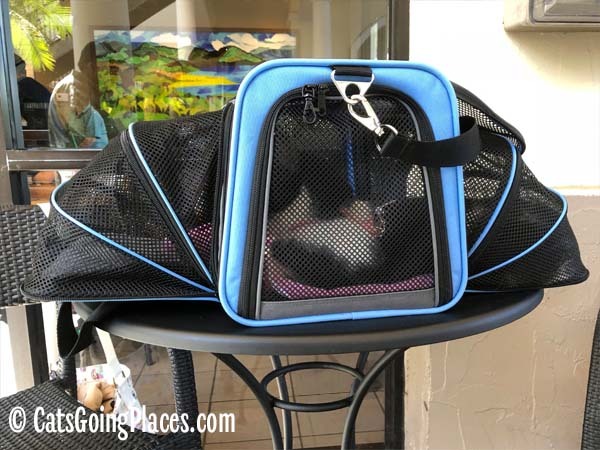 Our usual weekend routine at the coffee shop patio has Cupcake’s carrier up on a chair next to mine, and there was no way the fully-expanded carrier was going to fit there. It was more practical for me to open one end open while leaving the other zipped closed. 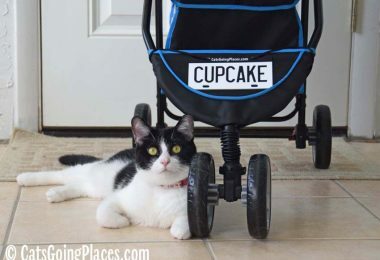 This enabled me to fit Cupcake and the carrier in a chair. I liked having the extended end of the carrier actually open, and I was able to do that with the mesh unzipped. You can see in the photo below that the mesh is partly pushed back into the body of the carrier and partly still hanging out attached to the folded-down extension. 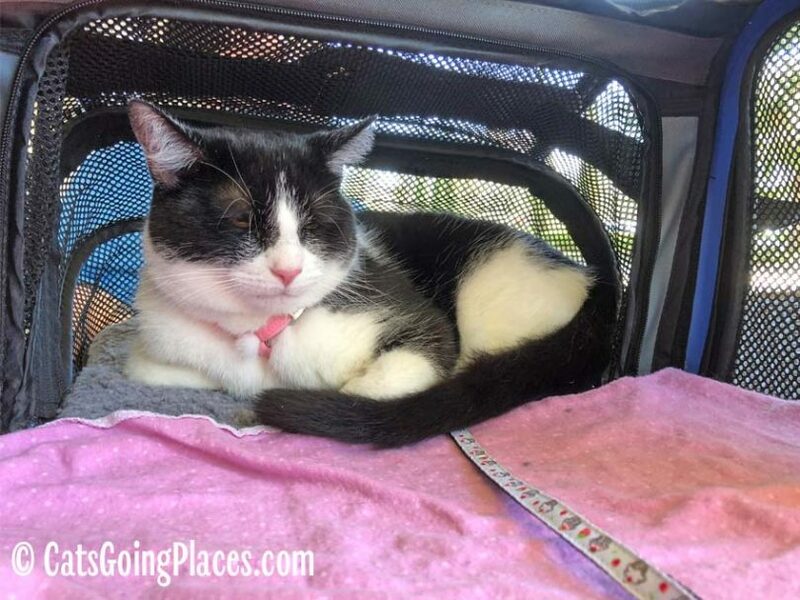 It really gave Cupcake a big window onto the world while she hung around outside the carrier. 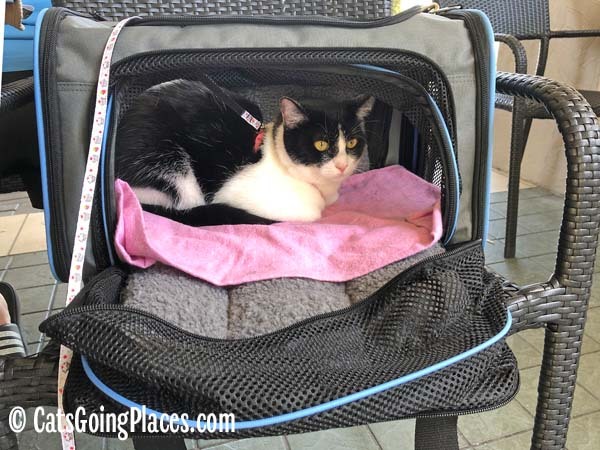 The Jackson Galaxy Expandable Pet Carrier has a lot of attention to detail. 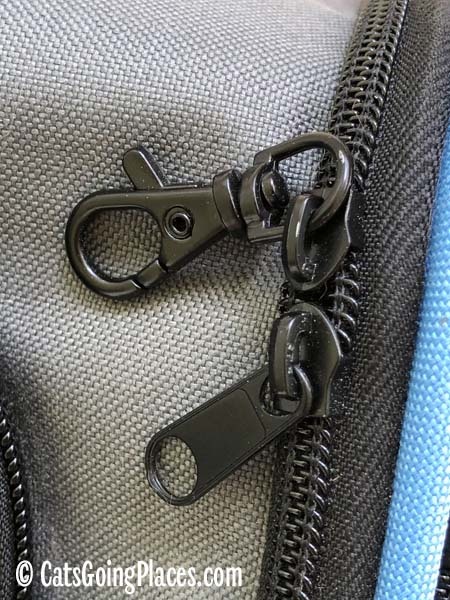 The hardware and buckles for attaching the shoulder straps are metal instead of plastic, and they seem like they would be durable for a really long time. One of the details I thought was very smart was every one of the zippers has a regular zipper pull and a zipper pull with a little latch attached. 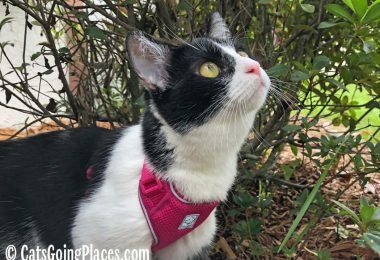 While Cupcake isn’t a little Houdini, I have heard so many stories of cats working their way out of zippered carriers at really awkward times. 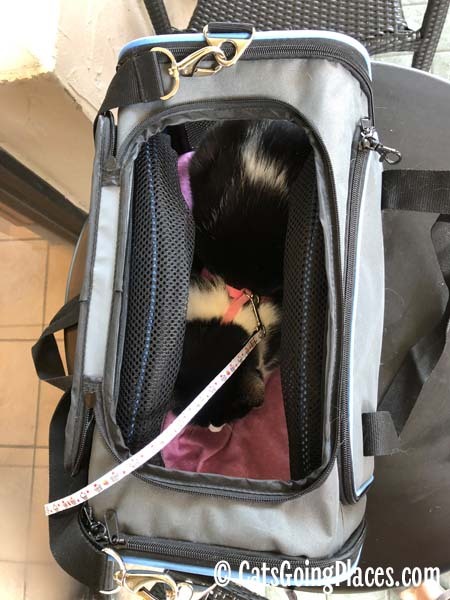 Having a way to latch the zipper shut to keep a cat from breaking out of the carrier while you’re in transit could be the difference between safety and losing a cat, so I applaud their including that feature. The carrier itself is medium-sized, 17.5″ long, 11.5″ wide, and 11″ tall. I don’t know of any airline that would accept a carrier this size, and the carrier is surprisingly rigid. You wouldn’t be able to crush it down to fit under a seat that it isn’t designed to fit under. It’s a great carrier for travel, with a plush pad in the bottom that can be removed for washing, but check carefully with airlines before assuming it’s right for your flight. Finally, keep in mind that the drop sides of the carrier actually tuck inside long sides of the carrier when they aren’t in use. 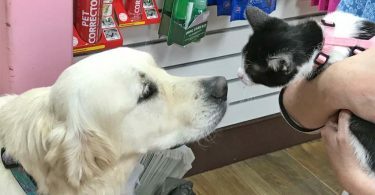 It’s not a big deal, but they do take up a bit of space, so if you have a large cat, factor that in. Cupcake was not uncomfortably crowded, since the excess mesh you see in the photo above is mostly at the top, near the large top entrance door to the carrier. Overall, it’s a remarkably good carrier, and one of my favorites Cupcake has test-driven. You can purchase the carrier at Amazon or in some local retail stores. I don’t if Chanel would like the mesh piled up inside the carrier, but I like the expansion part. So happy to hear this worked for Cupcake! 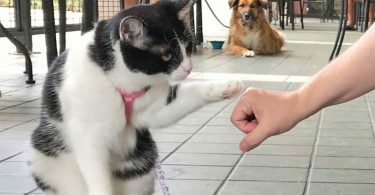 I knew you’d like it since the two of you went on daily trips together. This looks like a very cool carrier – I’ve been wanting to give this one a try.